If you are looking for a real estate agency in Costa Blanca that is an expert in Moraira villas for sale, come to Spanish Property Sales. We are an agency specialized in this type of new build and resale homes. We help many people, mostly of foreign nationality, who seek to enjoy a holiday or retirement period. Our real estate agents begin to facilitate all procedures from the first contact. We work daily so that the client feels comfortable and worried at all times. Our starting point lies in the exhaustive analysis of the client's needs. Once we know perfectly the priorities of the future owner, we take care to offer you the best villla for sale in Moraira. Another of our strengths lies in the pre-adaptation to the new area. Before the client moves to his new property in Spain, we inform him of all the qualities of the city to which he will reside. In this way, the client is better adapted to his new home. In our real estate we are aware of the responsibility of buying a new property. Therefore, we guarantee that the investment will be rewarding. If you have always dreamed of being able to buy a property that was built near the sea, if you discover now Moraira villas for sale you will see that you can make that dream come true. Most of our new build and resale villas in Moraira are built very close to the Mediterranean coast. In this way, you can wake up every morning and observe a beautiful maritime landscape. Who has never dreamed of having breakfast on a beautiful terrace while contemplating incredible ocean views? With Spanish Property Sales you can have breakfast like this every day of the year. Another advantage of buying a villa in Moraira near the sea is that you can quickly move to the most popular beaches in the city. You will not have to take any transport. Just walking you can enjoy its transparent waters and its soft sands. 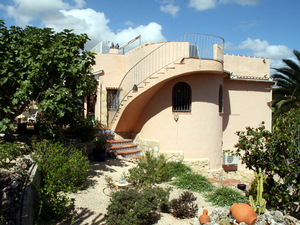 If our villas for sale in Moraira are special, the reason is not only in the proximity to the sea, but in the climate. In addition to buying a property of authentic quality, you can enjoy it in a city of authentic quality. The annual average temperatures usually oscillate between 15 and 17 degrees. Their winters are short and pleasant and the summers dry and hot. In short, the best city in Spain to enjoy your holidays. We will provide everything you need so you can start organizing your new adventure in Moraira - Costa Blanca.